In a 10.5-year study, researchers analyzed the food frequency questionnaires and health records of nearly 450,000 people involved in a National Institutes of Health (NIH)-AARP Study. By the end of the study, 2,904 people developed malignant melanoma, a serious type of skin cancer that occurs in cells that produce pigmentation, and 1,874 people developed abnormal skin cells that could lead to cancer (aka “melanoma in situ”). After adjusting the data to account for various risk factors (i.e., smoking, alcohol use, education, body mass index, physical activity, family history of cancer, and exposure to strong sun rays), researchers found some interesting associations: People who drank four or more cups of coffee per day were 20 percent less likely than non-drinkers to develop malignant melanoma, and people who chose caffeinated coffee in particular were even less likely to develop it. Coffee didn’t seem to reduce the risk of melanoma in situ, probably because it progresses differently than malignant melanoma, according to the study authors. 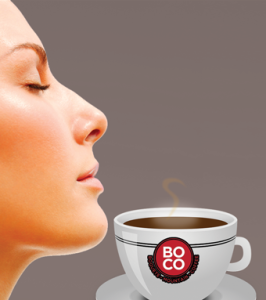 So how does coffee do such awesome things for your skin? The study authors think it contains some super-special compounds (including caffeine) that, at least according to studies conducted in laboratories and on animals, appear to fend off cancer in a few different ways: They suppress cells that turn cancerous in the sun, reduce inflammation, fend off oxidative stress and DNA damage, absorb harmful sun rays (kind of like sunscreen), and detoxify carcinogens — all wonderful news for people with shamefully high coffee bills and a constant coffee buzz. Next post: Now Available At Earth Fare!